Florida hosts more large springs than any other state, but only a few remain pristine. Geologists are studying the states springs to help restore and preserve their health. Keeping a watershed healthy means paying attention to the water on the surface and to the water underground. Visit our new online On Exhibit Archive. Read reviews of museums and exhibits across the United States! Read our special careers page. Do you have questions or comments for Geotimes? Influencing a policy means demonstrating its importance to an elected official’s constituents. As constituents ourselves, geoscientists are uniquely qualified to make this connection. For these twin geology students, field-based summer internships fueled their passion for fossils. On May 8, 1902, the eruption of Mount Pelée killed 28,000 people and became the century’s largest volcanic disaster. 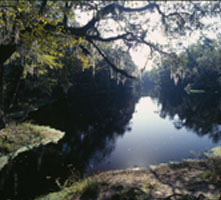 A view of one of the springs in the Gainer Springs complex north of Bennett, Fla. Read story. Photo supplied courtesy of Tom Scott, Florida Geological Survey.